Although I grew up in Vancouver, I never knew that city in the summertime. When I was a child, we always went to the Interior, leaving after school finished at the end of June for a cabin on Shuswap Lake near Salmon Arm and not returning to the coast until Labour Day. The cabin is long gone, burned down years ago, and the "Dominion" and the "Canadian" -- the sleek trains which used to bring fathers up from the coast for the weekends -- are nothing but a memory, but nevertheless the Interior still attracts me, and the change of climate, light and scenery from the cool coast cedars to the open, dry pine woods east of Hope is elating like a whiff of pure oxygen." One hundred miles east of Vancouver at the community of Hope, the TransCanada highway climbs into the mountains, following the dramatic, historic Fraser Canyon. The largest community in the canyon is Boston Bar, which has grown to serve modern highway travellers. Across the river is an older community, North Bend, established in the 1880s as the divisional headquarters for the Canadian Pacific Railway; it retained much of its historic flavour until the mid-1980s, when a vehicle bridge was opened across the river. Within a half-dozen years, most of the businesses in North Bend closed, unable to compete with the highway-supported places in Boston Bar. I painted extensively in North Bend in 1992, and published most of the images in B.C. in Watercolour. I did not return until the summer of 1999, when I found the old cafe had burnt down and all but a handful of the historic buildings had been abandoned or lost. 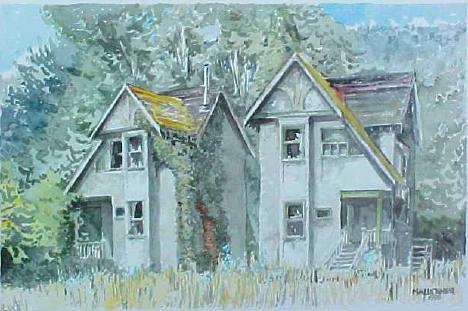 Two I hadn't painted on the 1992 trip were the pair of buildings known locally as "the CPR houses." Standing forlorn, with their windows broken, these two--probably built in the 1880s--were doubtless just awaiting a local delinquent with a match. Since writing this I received messages from C.B. Peters which led me to develop the North Bend pages on the Vanishing BC part of this site. The houses are stuccoed with simple half-timbering in their gables. With their distinctive profiles, they are easily visible from the Trans Canada Highway near Boston Bar. The Thompson River, which flows into the Fraser River at Lytton, passes through a canyon whose rocky walls are the closest thing in British Columbia to a painted desert. Sagebrush dots the hillsides while, higher up, ponderosa pines cling to islands of soil between the rocks. Lytton is often the hottest spot in British Columbia--indeed, in Canada--with temperatures regularly soaring above 100 degrees Fahrenheit. Further east in the canyon, the river bisects the railway community of Spences Bridge. On benches above the river, fruit ripens quickly in the blazing summer heat, and is sold at roadside stands to passing tourists. Church at Pokhaist Village near Spences Bridge, British Columbia (enlarged detail from 1994 painting) from the other side of the Thompson River. About 12 miles east of Spences Bridge on the TransCanada Highway, a traveller can look across the river to a tiny church on a bench beneath a mountain whose face has been scarred by repeated rockslides. A wooden church on an isolated ranch, the wind blowing through the sagebrush, freezing in winter and scorching in summer--a typically powerful image from this part of British Columbia of puny humanity struggling against a hostile environment. The abandoned church and ranch are only accessible by a 4x4 road through gated grazing land following the opposite side of the river from the highway. Evidently it was called Pokhaist Village, and the church is St. Aidan's. The only photograph I have ever seen of it was taken in 1960 by Donovan Clemson for his book Old Wooden Buildings, published by Hancock House in 1978 and still available at the roadside shops catering to tourists. I made a list of the colours as I painted this: black, cerulean blue, cadmium yellow, yellow ochre, Indian red, ultramarine, and olive green. The challenge of painting in this desert is to capture both the dullness of the colours and the brightness of the light. Twenty or so miles east of St. Aidan's, the TransCanada highway swings away from the Thompson River into an even more arid area between Ashcroft Manor and Cache Creek. Ashcroft Manor, named for the family seat of English remittance men Clement Francis and Henry Pennant Cornwall, is an 1860s-era roadhouse (now almost invisible within a grove of acacias) in whose modern parking lot I sat while painting the curious Department of Defense buildings and pylons nearby. I could never figure out what the pylons were doing there, out in the desert. and don't know if there's even an airport nearby. The town of Ashcroft, a few miles away, is one of the undiscovered heritage gems of British Columbia. The Canadian Pacific railway station closest to the goldfields of the Cariboo, it was an important town from the 1880s till the 1920s. Its hot climate was ideal for growing tomatoes and the soil was also found excellent for potato growing. Its heritage character has also benefited from its unique geography, as it is hemmed in by a steep hillside and a bend in the Thompson River, a constricted site too confined for shopping malls or the type of roadside dreck that afflicts towns such as Cache Creek nearby. Typical of the Victorian-era cottages in Ashcroft is the little one in the painting, with the dry sandy hills on the far side of the Thompson River in the distance. It is an interesting and scenic loop tour from Lytton, at the top of the Fraser Canyon, north on Highway 12 to Lillooet, then through the drylands to Pavilion and across to Cache Creek, returning to Lytton via Ashcroft and Spences Bridge. Lillooet, whose courthouse and provincial buildings appear in the sketch on the left, is an historic mining town set amidst dramatic scenery. One of the great tourist drives on the planet is from the Whistler-Pemberton area, up to D'Arcy (the home of the little church sketched at the top of this page), then backtracking to the Duffey Lake road, which passes through some of the most extraordinary mountain wilderness anywhere before arriving in the dry interior at Lillooet. The road from Lillooet to Pavilion Lake passes through dramatic dry valleys, including the one pictured below, framed by blue pine forests on the surrounding hillsides. An easy return to the coast is via Spences Bridge and the picturesque Highway 8 to Merritt. There, the Coquihalla superhighway streaks through the mountains to Hope, meeting the freeway into Vancouver. Railway enthusiasts ought to take the opportunity to detour into Brookmere, taking the Coldwater Road exit and driving the few miles in. Brookmere was a stop on the fabled Kettle Valley Railway, abandoned about 20 years ago, that in its heyday connected the Canadian Pacific Railway at Hope with the Okanagan Valley and the southern Kootenays. In the years before the Coquihalla highway opened, it was a difficult trip into Brookmere, usually involving hours on washboard roads from Tulameen via Princeton, or from the old Coquihalla road that followed the railway roadbed up the canyon from Hope. Today, a visitor can see the old water tower--the last one left on this section of the track--the old station-master's house and other railway buildings, still painted in the familiar "CPR red"--the colour of dried blood, as Margaret Laurence described it. The right-of-way between Summerland and Spences Bridge was acquired by the B.C. government in 1996; 248 kilometres long, it is accessible by foot and bicycle for most of its length.